Can pain be released through a pen? In the midst of pain, physical or emotional, we often seek relief in professionals. But what if part of the solution is actually within us? Writing our stories is deeply cathartic, “a soul vitamin,” as Dr. Clarissa Pinkola Estes calls it. So, do you have a story that causes you pain, that you’ve never told, or that you feel no one will listen to? 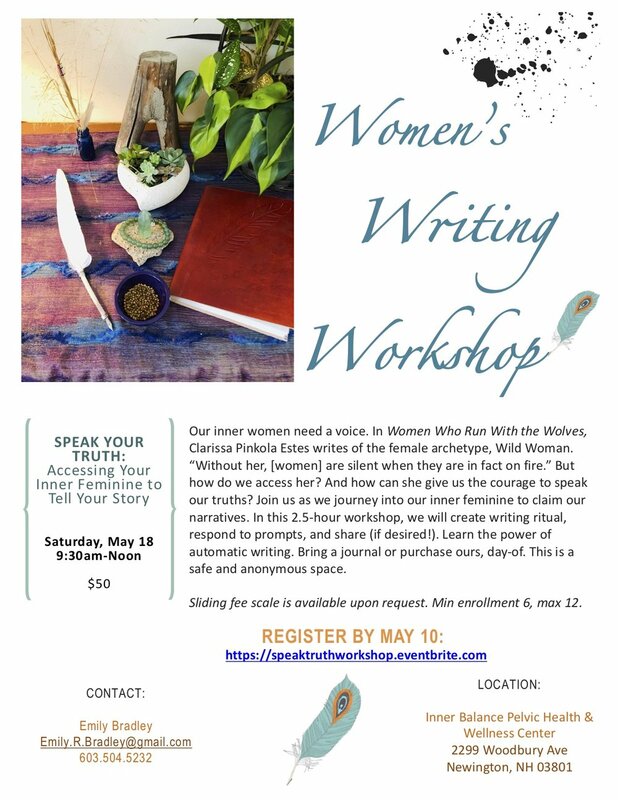 Join a group of brave women in this 2 hour workshop as we respond to prompts, share (if desired), and learn the healing art of journaling. This is a safe and anonymous space. Just bring a pen, a journal or paper, and an open mind. If you can't find the "perfect" journal, don't worry! We will have journals (for purchase) at the workshop. Minimum enrollment 6, max 12, please pre-register before APRIL 5th to ensure your spot! Our inner women need a voice. In Women Who Run With the Wolves, Clarissa Pinkola Estes writes of the female archetype, Wild Woman. “Without her, (women) are silent when they are in fact on fire.” But how do we access her? And how can she give us the courage to speak our truths? Join us as we journey into our inner feminine to claim our narratives. In this 2.5 hour workshop, we will create writing ritual, respond to prompts, and share (if desired). Learn the power of automatic writing. This is a safe and anonymous space. Minimum enrollment 6, max 12, please enroll by MAY 10th to ensure your spot!